Loneliness. It is a BIG issue for our seniors. Home / Loneliness. It is a BIG issue for our seniors. One in four older adults say they feel isolated from other people at least some of the time, and one in three say they lack regular companionship, according to a new national poll. This isn’t news to us. We have been talking about this issue since 2014. One of our presentations we regularly provide is “Loneliness in Seniors, why it exists, and how we can help”. 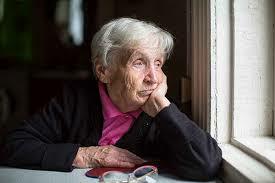 This great article summarizes a recent poll about loneliness in Seniors. Read more to see how you can help.